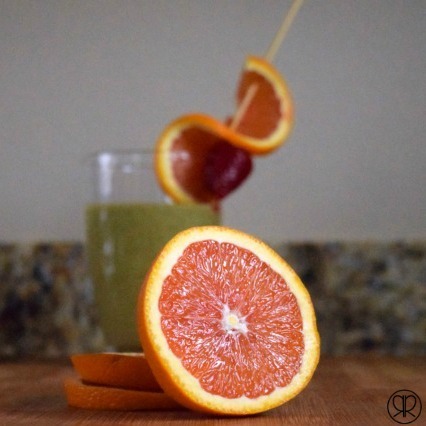 This healthy smoothie recipe with blood oranges is a prep-ahead, dairy-free, soy-free, gluten-free, green and healthy smoothie that tastes so good it will please the whole family! The coconut water is a source of natural electrolytes, making this a great option for kids who need to replenish after sports practice. Smoothies are one of my favorite ways to get additional vegetables into my family’s diet. And hey, quick breakfasts are a must, especially for little ones who need to eat shortly after waking. Combining the two just makes sense, doesn’t it? Buying fresh, organic fruits and veggies in bulk and freezing them really helps to control costs and still allow us to eat organic about 90% of the time. We also find large bags of frozen organic fruits are on sale often, so the freezer section has become our friend when looking for smoothie ingredients. This healthy smoothie recipe makes 3-4, 8-ounce servings and delivers healthy doses of filling fiber, protein, Omega 3’s, and naturally occurring electrolytes. If you’re eating clean and green, this is a wonderful addition to your meal plan. And because so much of this is frozen, you can measure and prep bags to grab and dump in the blender quickly. Who doesn’t love that? The secret to a protein powder that you and the kids will love is that it cannot taste like chemicals. We like Orgain and we’ve used it for more than 3 years. If you’re looking to add a protein powder, this is a great non-whey option. Add the frozen ingredients into your blender first and top with the rest. Give it a mix on your ‘make mommy a margarita’ or ice crusher setting. After you are certain you like the consistency (adjust by adding coconut or filtered water), dump it into a cup and enjoy. I pour my daughter a cup and fill a few miniature pop molds to pop in the freezer for desserts later in the week. To make it for myself, I add an additional 1/4 cup of water and my protein powder to the rest of the smoothie in the blender. After a quick pulse, I get 8-10 ounces of an energizing, filling smoothie. If you’re looking for other smoothie recipes, try this blueberry one but if you’re looking for so much more, go ahead and sign up for our weekly newsletter! Sure there’s great stuff from us, but there’s also a super-secret, member’s only section of Ruffles and Rain Boots. 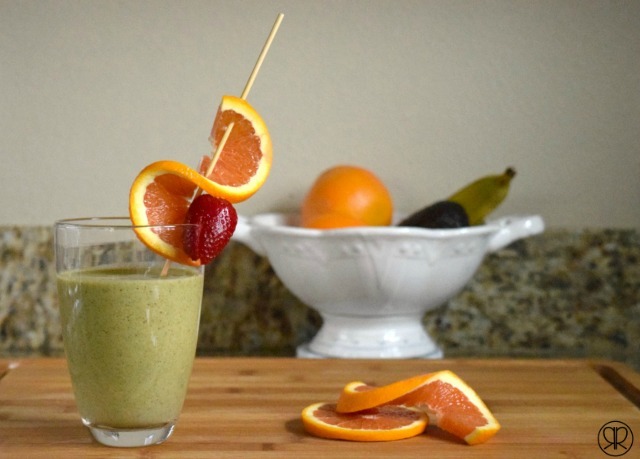 Do you love green smoothies or can you barely get them down? Drop your favorite combo in the comments below and please pin this to your healthy eating board on Pinterest. Your shares are how we grow and we are sincerely grateful. This looks so so so good! I’m gonna try it for breakfast tomorrow! I’m not really a smoothie person but I had something just like this at my mom’s house yesterday and it was SO GOOD. I could feel the goodness entering my body. I love it. Tamara invites you to read How To Unfold Your Love. This sounds really good! Great way to get more fruits and veges in your diet. Thank you for sharing it at What We Accomplished Wednesdays. Have a great weekend! Oooh I like this! I always feel better with a smoothie for breakfast. I have never used chia seeds though in anything and will need to scan out where I can buy them. Thanks for sharing! Jen invites you to read To Ban Or Not To Ban Yoga Pants? Jen, chia seeds can be purchased at any Trader Joes, green market, or even Safeway (and the like). We add them to smoothies, yogurt, and even salads for a healthy boost and crunch. Well I tell ya, I have just finished a green smoothie and I love them. This is a fairly new adventure for me but I feel great. Sounds really good…I am going to try this one out! Thanks for sharing with the Thursday Blog Hop! Pam@over50feeling40 invites you to read A Transformed, I MATTER Woman….and the Thursday Blog Hop! I love the hop, Pam – thank you for stopping by today! Mmmmm. Looks and sounds great. 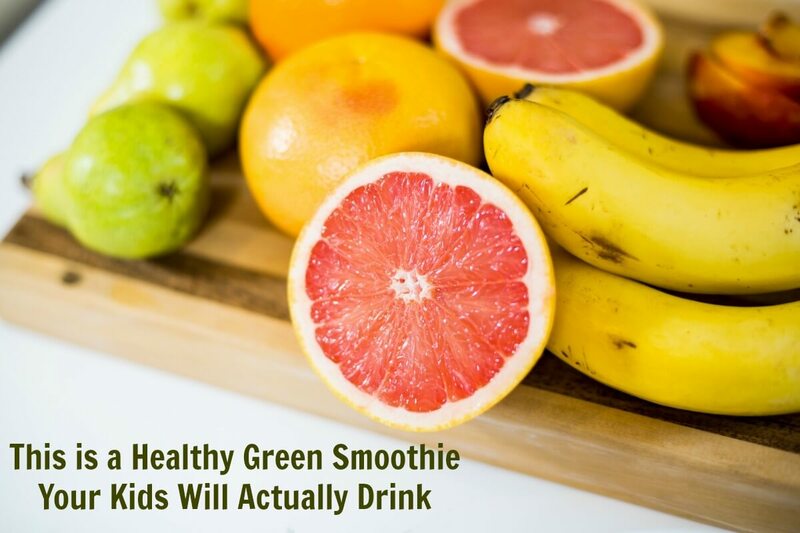 I actually prefer green smoothies… I feel even “healthier” after drinking them. That’s a great point, Jennifer! When we eat more greens, our bodies know it’s good for us and give us a little subconscious boost, don’t they? They do!! I feel like Popeye… or something like that LOL. This looks so yummy! My kids love smoothies for breakfast along with a egg or something. I will add this to my list of smoothies to make. Isn’t it amazing how all of us (bigs and littles) like smoothies in the morning? I am not a big fan of breakfast (I’m the most unhealthy person ’til about 10 am), but I find I drink less coffee and eat less throughout the day when I have a smoothie in the morning. Let me know if you share one of your green smoothie mixes, Emily – I love trying out new blends. This sounds delicious! My husband and I are trying to eat healthier so I may have to add this to the list to try for breakfast. Thanks! It is definitely a winner in our house, Kirsten. I measure out a lot of the frozen smoothie ingredients to save on preparation time, so maybe that will help you and your hubby? Thanks for stopping by! Oh Sarah this not only looks but sounds delicious. I would skip the protein powder as well but I think I’m going to be making this on the weekend. Madison would LOVE this! Pinning. Madison would probably love this – our little one gobbles up the greens with this smoothie blend!